On January 21st, we will experience the new postal rates. This will affect all sort levels and classes of mail and should be considered for all 2018 budgeting. Below is more detailed information about the primary categories that affect our clients. First-Class Mail Letter rates will increase from $0.49 cent rate to $0.50. First Class Postcards (4.25″ x 6″ or smaller), will increase from $0.34 to $0.35 cents. The additional charge for over one ounce first class letters will still be $0.21, and international letters will still be $1.15. 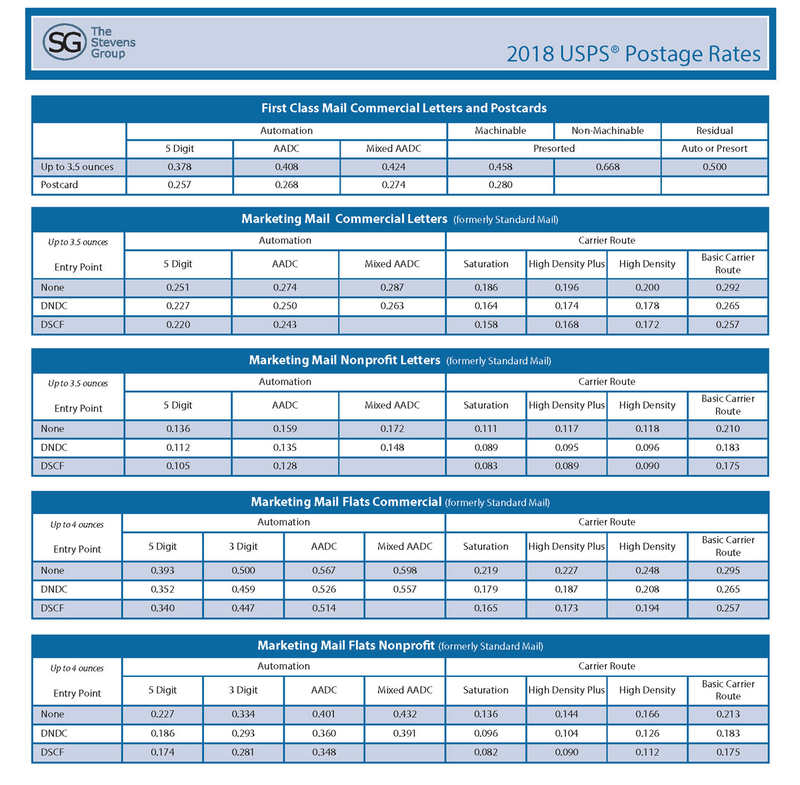 Businesses using metered postage, will increase from $0.46 cents to $0.47. Marketing mail will increase by an average of 1.94%. For Profit Presort Standard automated letters increase from an average $0.29 per piece to an estimated average of $0.30 cents per piece. However some sort levels have no increase. First Class Presort automated letters will increase from $0.40 to $0.41. Nonprofit rates have the largest swing on rate changes and can be confusing since some sort levels of nonprofit rate letters are going up between 0.6 to 3.2%, while flats are decreasing by 7% seven percent for the highest sort levels, but increasing 6.1% for the lowest densities.